If you know me at all, you know that I like to workout. Not everyone is into fitness, so I try to find things to do that others will enjoy but that will give me my often much-needed workout. There are plenty of fun activities to do in Falmouth. Believe me, I have a list of favorites that gets longer every time I'm here. But I love to try new things, too. 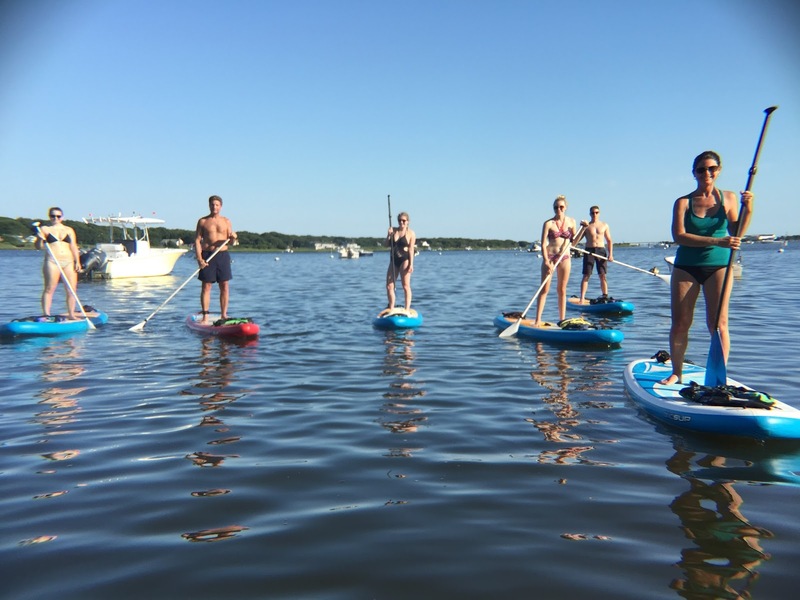 Last year I tried SUP Yoga for the first time with my friend Danielle and loved it. She's working on her Masters Degree this summer, so she put me in touch with her friend Amy of Peace Love SUP. I was thrilled that the whole family wanted to join me. Our group of six met Amy at Great Pond for a fun afternoon session on the water. 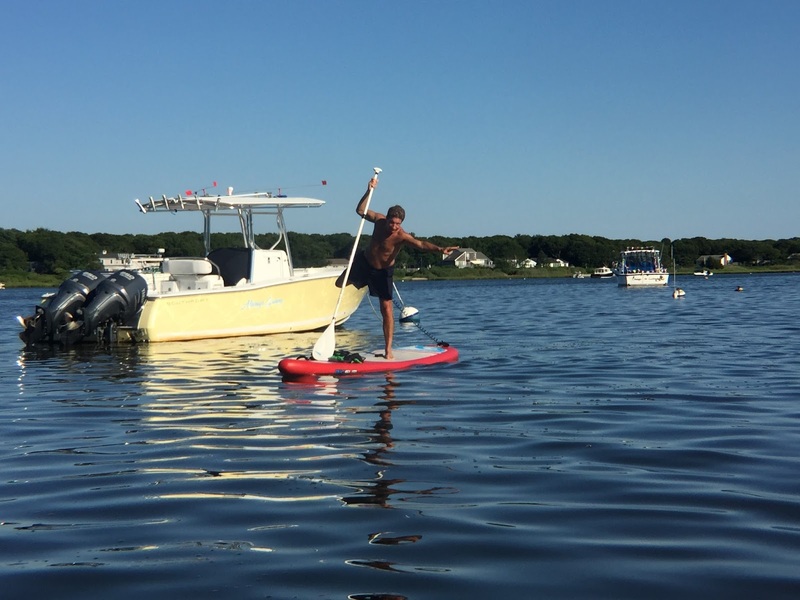 The girls and I had a challenging SUP Yoga workout. 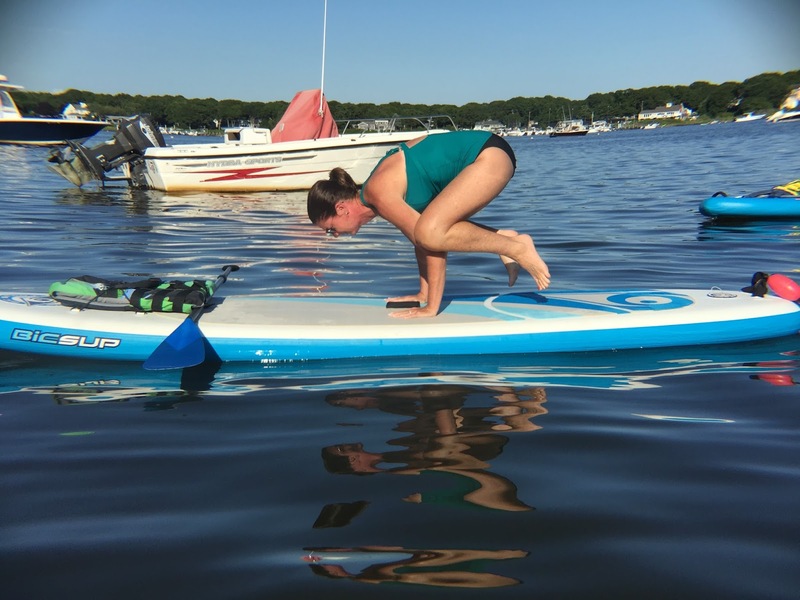 I'd love to say that I conquered crow pose on the board, but this is really just Amy catching my one second hold. She did not catch when I fell off the board trying to do side angle pose. The boys kept to SUP even though we tried to talk then into joining us for some yoga. W had a great experience with Amy on the SUP boards and several of us were even a little sore the next day. A new activity for us this year was Bottom Fishing with Patriot Party Boats. Bottom Fishing pretty much guarantees that everyone will catch a fish because they park the boat on top of schools of fish. Even though I just went along to watch and cheer on the group, I ended up giving fishing a try. It's a lot of work bringing a fish to the surface! I'm pretty sure you can call it a workout, especially if you catch a lot of fish. I think littleC caught eight! My new found enjoyment of hiking led me to The Knob on Quissett Bay Harbor near Woods Hole. The Knob is really a sanctuary that was donated to the people by Cornelia Carey. She wanted people to enjoy the woods, the birds, and the sea. There are two walking trails to get to the area known as The Knob lookout. The main trail is well maintained, wide, and takes you straight to the end. We took the Harbor Cliff trail which overlooks the inner harbor in spots but is narrow and not as maintained. Off the main trail is also access to Crescent Beach on Buzzards Bay. Many people were making a day of it, but we just enjoyed a quick dip to cool off. One of our favorite activities in Falmouth is the Shining Sea Bike Trail. The trail extends just over 10.5 miles from North Falmouth to Woods Hole. There are several trail heads so you can jump on and off at different places. Of course there is always swimming at Old Silver Beach. We like to walk the .50 mile there and then spend a couple of hours in and out of the water. There's also a water sports rental shop right on the beach. Do you like to workout when you're on vacation? How do you get others to workout with you?